In many parts of the world, the Internet is quick enough to allow businesses to operate solely in the cloud with relatively few problems. There are however issues with many Internet connections, and at times the service can slow to a crawl, leaving many managers wondering what is going on and how to fix it. 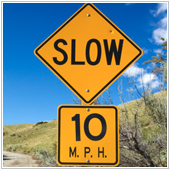 Have you noticed that from time to time the Internet is a lot slower than it should be? If so, this could be because something is hogging all the bandwidth, which is the rate at which data is transferred in and out of one connection. Here are six of the most common bandwidth hogs. YouTube. If you allow employees to watch YouTube or connect to other streaming services, and they are using it frequently, you’ll notice a significant decrease in overall Internet speed. Some companies have noted that 40 staff using YouTube will account for over half of the total bandwidth usage. FTP sites. Some companies run FTP sites that host essential files that employees can download. When more employees are downloading/uploading files to the FTP site there’s less bandwidth available for other operations, so the Internet will be slower. P2P. P2P covers a large number of aspects including video conferencing and sharing of files via programs such as BitTorrent. All P2P services use an incredibly large amount of bandwidth when in operation, slowing the Internet to a point where speeds from 10 years ago were faster. Online backup. Backing up essential files will capitalize bandwidth leaving very little for other operations. It’s a good idea to conduct backups after office hours to minimize interruptions. Encryption. In certain industries regulatory bodies require a certain level of encryption, or for companies to take certain steps to secure data. Any extra encryption or security features will slow sites down, however this usually cannot be avoided. Spam/Virus/Malware. As many scams aim at stealing information the main way this is done is by sending the information over an Internet connection, that is your Internet connection. If you have viruses or other security threats you can guarantee that your Internet will be slower. limit the bandwidth assigned to YouTube and other streaming services. Before you tinker with any network connections though, it’s best to contact an expert . We may not just be able to help, but potentially provide an even better solution for you, speeding up your connection and your business success.